Mobility is a very popular word these days. It applies to ride hailing, carsharing, and carpooling. It also applies to bicycles, scooters, and a raft of “last-mile” transportation devices intended to get people to work in the morning without having to do any actual walking. 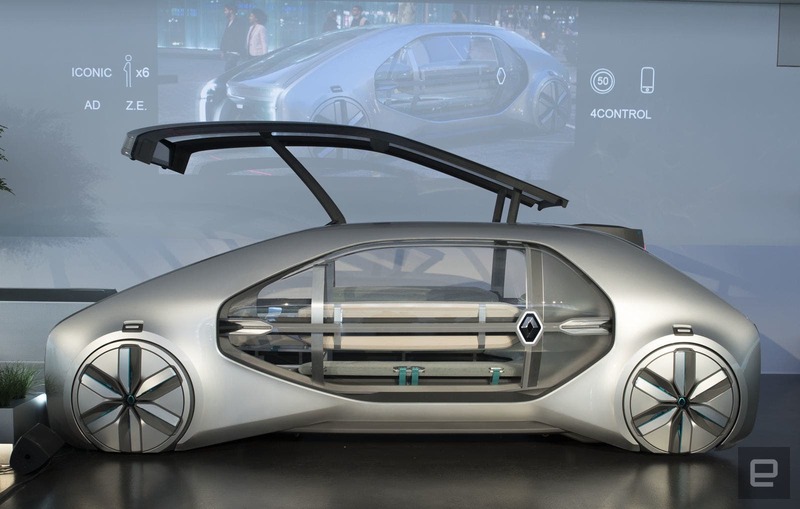 Renault has looked at everything going on in the mobility sphere these days and decided what the world really needs more than anything is the EZ-GO, a four-wheel, all-electric autonomous transportation pod with a portcullis-like device grafted onto the front and a U-shaped couch inside. Who are we to argue? The EZ-GO concept graced the Renault display in Geneva this week and it’s not like anything the world has ever seen before. It’s a high-roof electric vehicle made expressly for urban mobility (there’s that word again). The large opening at the front is designed to let passengers enter and exit standing up while shielded from other vehicles, perambulating pedestrians, and cyclists. The large expanse of glass on all sides is there for a reason. Surveys done by the company indicate people are not comfortable being in a closed vehicle with strangers. They want those outside to be able to see in and they want to be able to see out. 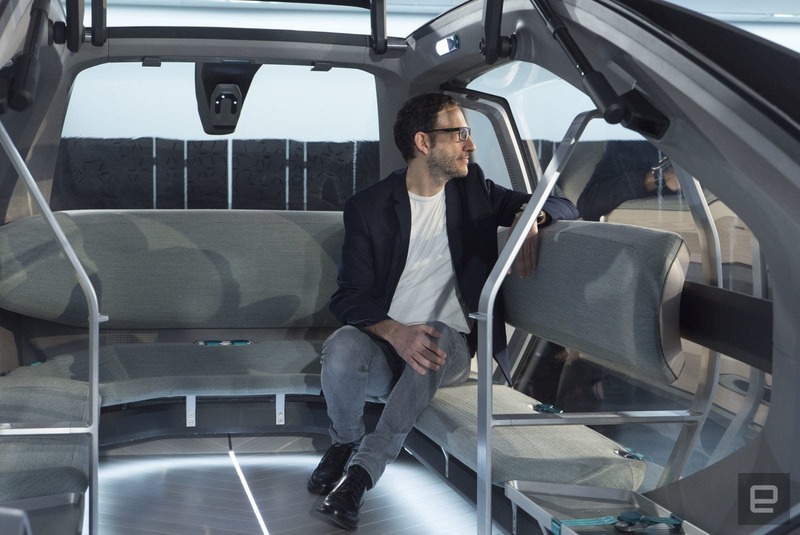 “When you are in our car, on the bench seat and beside a big window, it’s like you are on a park bench that’s somehow moving,” Stéphane Janin, Renault’s manager of concept cars, tells Engadget. Then there is the issue of helping women feel safe at night. “If you’re a woman and it’s late, you could ask for girls-only service,” he says. “Then it becomes a riding pool with no driver and only women in the vehicle so that they will feel safe.” A lot of women will probably find that a very attractive feature. The EZ-GO has four-wheel steering for agile maneuvering, air suspension for soaking up potholes and speed bumps, and a full complement of autonomous driving sensors built in, including Lidar embedded in the airfoil device at the rear. It is intended for Level 4 self-driving within a geofenced area and can stop, start, change lanes, and turn corners without a human driver. Think of it as a horizontal elevator on wheels. The EZ-GO is conceived as a more sociable service than Uber of Lyft that will also cost less than either, but still more than a bus. The front opening conceals a ramp to make ingress and egress convenient for people with disabilities. Is it a thing of beauty? Perhaps, perhaps not. Beauty is in the eye of the beholder. But it does offer a fresh perspective on urban mobility, one that answers questions others haven’t even thought of. 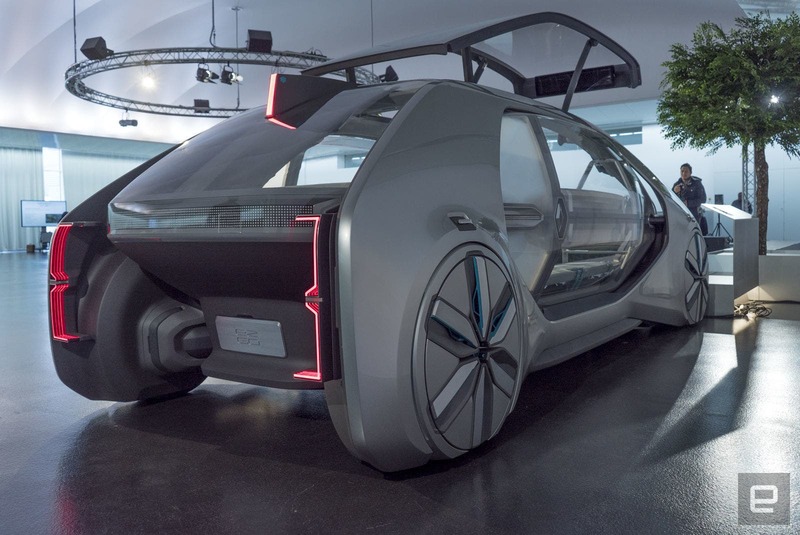 Most manufacturers want to simply build conventional cars, equip them with autonomous driving technology, and send them off to make money for them 24 hours a day. Renault has done its homework and made its vehicle serve the needs of customers rather than forcing customers to serve the needs of the manufacturer. The EZ-GO was probably the slowest vehicle in the hall at Geneva this year, but it may be one of the most inspired. Renault says its futuristic people mover may be available by 2022 for use by private companies or public transportation services.